Releasing Michael like an empty bubble. On the twenty-third Michael ascended from the earth. 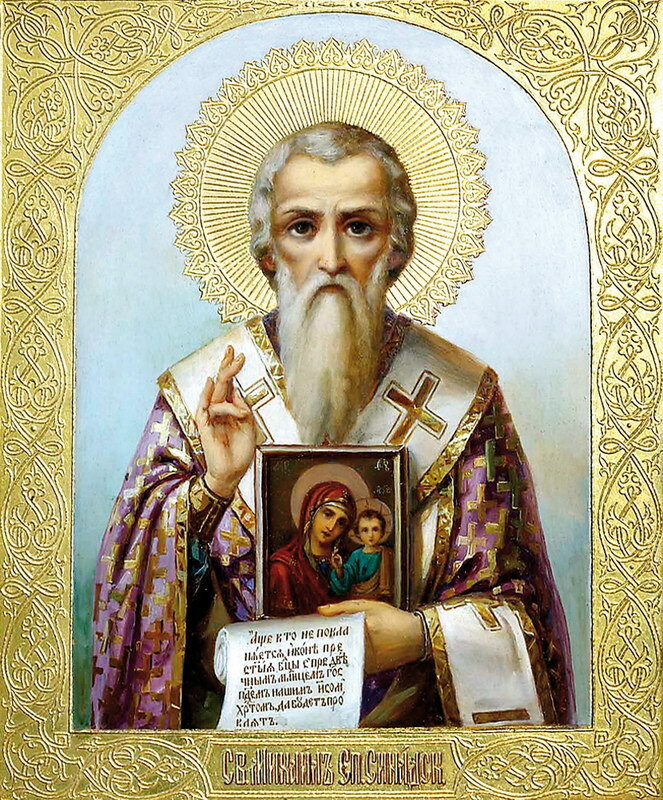 Our Venerable Father Michael was from Synnada in Phrygia of Asia Minor. He was consecrated to God from his childhood, and he purified himself with a life of perfection. 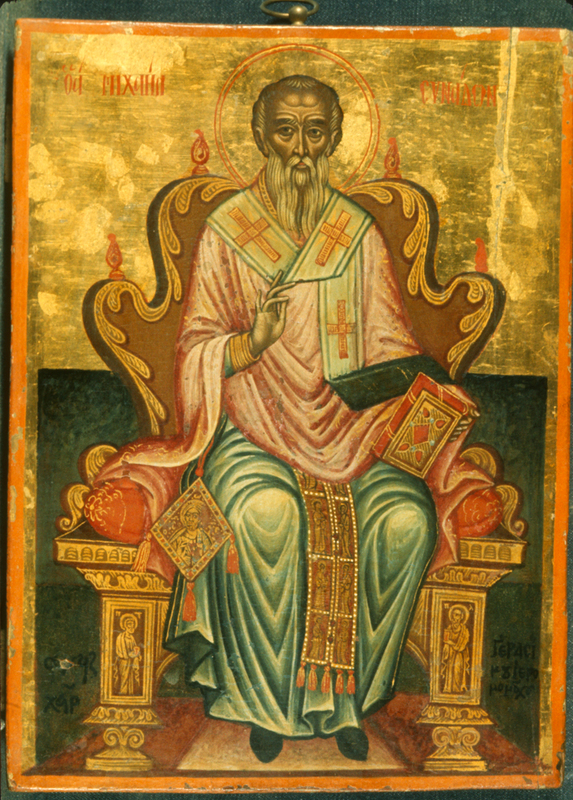 To further his education, he went to Constantinople, and there he met Saint Theophylaktos (Mar. 8), the future Bishop of Nicomedia. 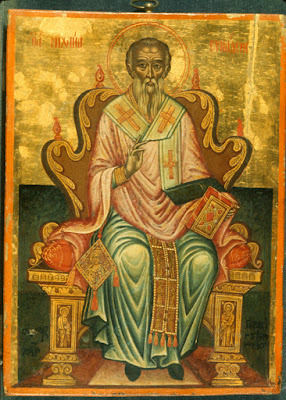 Desiring to become monks, Saint Tarasios the Patriarch of Constantinople sent them to a monastery near the Black Sea. There the two monks lived a life dedicated to prayer and asceticism, and God glorified them with the gift to work miracles. Once, during a harvest, when the people were weakened by thirst, an empty metal vessel was filled with water by the prayer of the monks. Because of their great virtue, Saint Tarasios afterwards compelled them to accept the priesthood then consecration as bishops, Theophylaktos as Bishop of Nicomedia, and Michael as Bishop of his native Synnada, in the year 784. 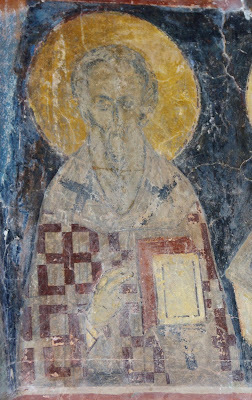 Bishop Michael was present at the Seventh Ecumenical Synod at Nicaea in 787, where he defended the veneration of the holy icons. Through his holy life and wisdom, Saint Michael won the love of believers, and the notice of the emperors Nikephoros I Phokas (802-811) and Michael I Rangabe (811-813). At the request of the Emperor Nikephoros, he carried out diplomatic missions for Byzantium at the court of Charlemagne in 803 (and later in 807) at his palace at Salz on the river Saale in France, and served as his envoy and visited Caliph Harun al-Rashid in 806 to conduct peace negotiations preventing the onslaught of the Abbasids. 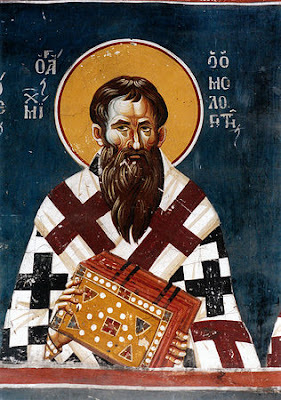 Patriarch Tarasios sent Bishop Michael as the courier of a synodal letter to Pope Leo III in 811, ending a six decade schism. In the time of the wicked iconoclast Emperor Leo V the Armenian (813-820), Bishop Michael defended Orthodoxy, bravely opposing the heretics and denouncing their error. Leo the Armenian brought Saint Michael to trial, but not fearing torture he answered resolutely, “The immaculate icon of our Lord and God and Savior Jesus Christ and His divine Mother I piously revere and venerate, while your decree and definition I spit upon and give it no thought.” For this he was deposed from his episcopal throne and sent into exile. After being driven from one place to another, in many hardships and bitter pains, Saint Michael reposed in exile in Eudokiada in 818. 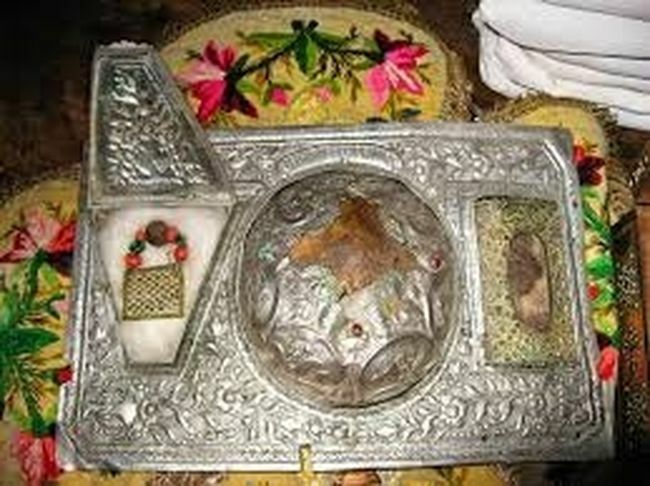 His sacred feet are found in the Athonite Iveron Monastery, but his holy head is in Great Lavra Monastery. Saint Michael is invoked for protection of crops from pests. Thus in 1628, locusts plagued the island of Cyprus so severely over a period of seven years that it caused a famine. Archbishop Matthew Kigala therefore requested for the head of Saint Michael to be brought from Mount Athos in order to banish the locusts, but the monks would not grant approval, as it was the custom to never remove the relics. The Turkish Sultan therefore sent the monks an imperial order to have the sacred head brought. After processing the head of the Saint around the island and sprinkling holy water, the locusts were immediately expelled and drowned in the sea. As a result, the people of Cyprus, both Christians and Muslims, donated 5000 piastres to Great Lavra Monastery upon the return of the head of the Saint as a thank offering. 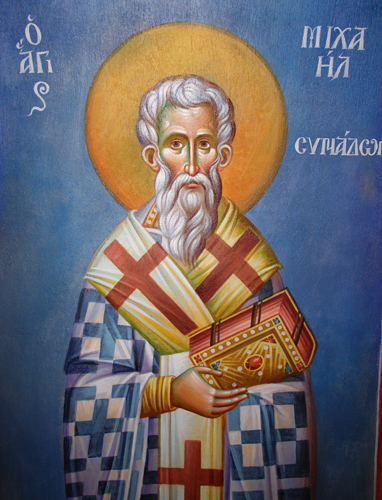 Also, in 1645, Patriarch Makarios of Antioch mentioned using the right hand of Saint Michael of Synnada against locusts, driving them into the sea. You are a guide of Orthodoxy, a teacher of piety and modesty, a luminary of the world, the God inspired pride of monastics. O wise Michael, you have enlightened everyone by your teachings. You are the harp of the Spirit. Intercede to Christ our God for the salvation of our souls. From thy youth thou didst dedicate thy life to God, and wast proclaimed shepherd and Hierarch of Christ. O holy Michael, thou didst endure afflictions and exile, through honouring the icon of Christ, and dost now pour forth healings for us all. We venerate thee, O Michael, as a venerable hierarch and a champion of piety. For not fearing the notorious tyrant, thou didst overcome heresies and loudly proclaim: I venerate the icons of Christ and His Immaculate Mother. Having dawned upon the world like a great daystar, thou dost shine upon all men with thy great virtues as with light and with the rays of thy miracles, namesake of Angels and worker of miracles.